Recently I started a job which requires me to commute to work via BART. BART has its own rules regarding bicycles on the trains, which meant that I needed to get a folding bike in order to commute through downtown during the rush hours. I quickly zeroed in on the Dahon Speed D7 as an affordable and popular model. I ordered mine online (from Safety Cycle, about 430 $US). It arrived in good condition, but (no surprise) needed some initial adjustments to the rear derailleur and brake before it was fully usable. Bike is entirely adequate for riding short distances. Not for steep hills nor downhill racing, but perfectly fine for short commutes. Space saver. The folded size is similar to a carry-on suitcase. Much easier to have on the train than a full size bike. Quick folding. True to the advertising, the bike can be folded and unfolded in about 15 seconds (with practice). In reality, the unfolding phase takes a little longer, as I’ll often make minor adjustments to the handlebars and seat stem until they’re in proper position. I’ve made a few marks on the metal with a Sharpie to make these adjustments faster. Bike is somewhat hefty at ~28 pounds. It’s “luggable” but not much fun to carry for long distances when folded. Most often I just wheel it up in front of the train and fold it before boarding. The 20” wheels aren’t as stable as 26” wheels – not as much rotational inertia. Initially the bike felt a little wobbly to me, especially at speed … I’ve since gotten used to it. Rust – two adjustment screws for the brakes are rusting slightly, though to be fair I’ve ridden the bike a fair amount in the rain. 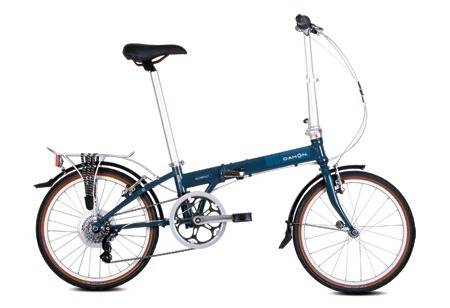 The Dahon Mariner is a similar configuration that promises more rust resistant components. The bike attracts a fair amount of curiosity on the train. I’m certain that – were I able to carry a spare bike along – I could have sold a few during my commutes. Quite a few people ask for details on price, manufacturer, and where to buy. Overall it has met my expectations and has facilitated my commute-by-subway.